When my Mom was visiting, my kids requested Chinese Food for dinner. Mom and I decided to make homemade Chinese food. 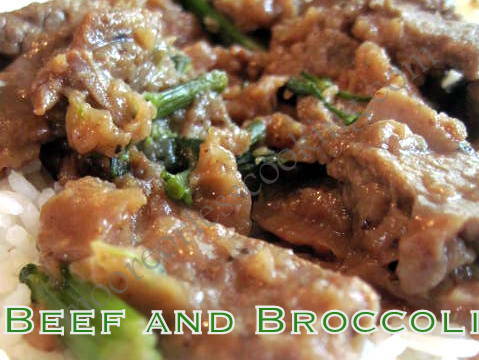 Beef and Broccoli was on the menu. The meat was very tender and cooked quickly. This is a great dish to make when you don’t have a lot of time and would like something really delicious! We doubled the recipe for 5 people. Trim any fat from the meat and cut meat into very thin stripsacross the grain. Strips should be bout 3 inches long. Combine the meat and the soy sauce, cornstarch, sherry, and sugar. Stir well and leave long enough for the meat to completely defrost. Trim the broccoli flowerets from the stalks and cut them into even sized pieces. Peel the stalks of the broccoli and cut into thin, diagonal slices. Slice the ginger into thin shreds. Heat a wok and add 2 tbsps of the oil to it. Add the broccoli and sprinkle with salt. Stir fry, turning constantly, until the broccoli is dark green. Do not cook for longer than 2 minutes. Remove from the wok and set aside. Place the remaining oil in the wok and add the ginger and the beef mixture. Stir fry, turning constantly, for about 2 minutes. Return the broccoli to the pan and mix well. Heat through for 30 seconds and serve immediately over rice. Using meat that is partly frozen makes it easier to slice thinly. If more sauce is desired, double the quantities of soy sauce, cornstarch, sherry and sugar.